With its compelling chic design, the Ascend™ Stapler brings a fresh yet sophisticated look to any office, especially with its added shiny gloss accent. 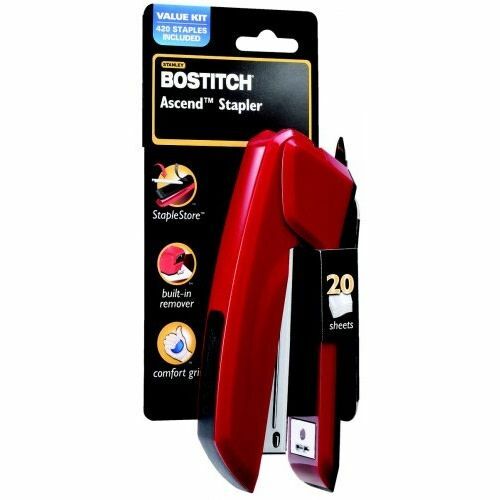 The unique curved shape enhances stapling comfort while stapling up to 20 sheets. Features a staple reload 'alert' window, and cleverly hidden in the base is an integrated StapleStore™ compartment that holds two strips of staples. For added convenience, the Ascend™ can be effortlessly opened 180 degrees for tacking and craft use. Includes a built-in staple remover, and non-skid base for desktop protection. Antimicrobial protected.